Iconic luxury hotel brand, St. Regis Hotel and Resorts, has announced its Canadian debut, The St. Regis Toronto: a 65-storey hotel with 258 guest rooms including 124 luxury suites, where guests will experience the bespoke service and modern elegance synonymous with the St Regis name. Those experiencing the luxury suites will be offered unparalleled, customised service, including the brand’s signature butler service, with whom guests can stay in contact at all hours of the day, thanks to a collaboration with the new eButler chat. The hotel offers guests a choice of culinary experiences: the LOUIX LOUIS – a grand bar and restaurant on the 31st floor, and the lobby-level café, Astor Lounge. The LOUIX LOUIS offers a combination of American cuisine and French technique, while its interior design draws inspiration from cocktail bars in New York and Paris. The two-storey Grand Bar offers excellence in its beverage list, which can be enjoyed in the bar itself, in an outdoor secret garden overlooking Toronto’s skyline or in a loft space which is available for private bookings. To add to the luxury, this new property offers a spa oasis which includes an infinity-edge lap pool and a fitness centre which offers specialised movement classes including yoga and pilates. Bears are taking over Parisian neighbourhood suburb, Le Gobelins, with sightings becoming more and more frequent. Bears have been sighted on the street, in cafes and even in hotels, but there is nothing to fear: the bears are less grizzly and more cuddly. But where are these bears coming from? Local bookshop owner, Phillipe, is the man behind the bears. Phillipe has 50 teddy bears in total which he has been placing around the neighbourhood since late October in an effort to bring the community together, and it’s no surprise that Phillipe is now known by name to the whole neighbourhood. If you would like to join in the neighbourhood fun, it’s time to book a trip to Paris. 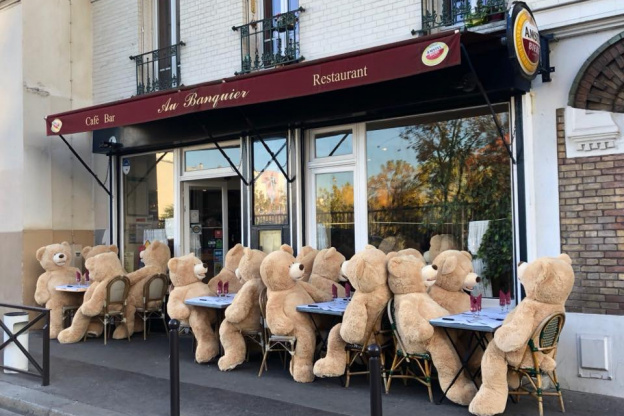 Phillipe has plans to move the bears around the community up until the Gallette des Rois celebration on January 6th – how does a teddy bear’s picnic in Paris sound?